I have been craving Mexican - Tex Mex - Southwest flavors so much the last couple of weeks. I am sure it has something to do with the never ending winter, and tasting flavors from warmer places are a form of therapy. What is better than enjoying these flavors? Enjoying them in a soup! 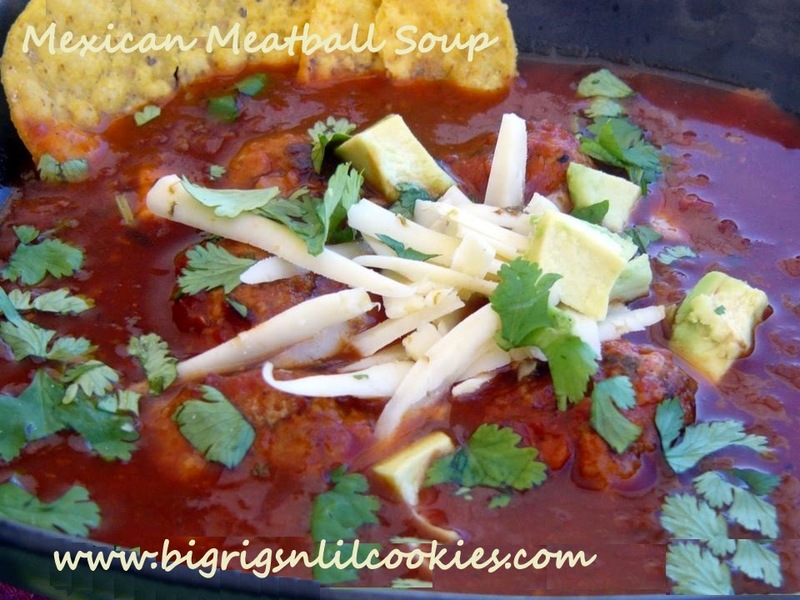 I had pinned this Mexican soup a while ago. Soup, plus the therapy of my favorite flavors. Win, win! It was a bit challenging getting a few of the ingredients in my local town, so I had to finish up my shopping when we went to the "big" town over the weekend. Who knew it was so hard to find ground turkey in the middle of farm country. And, Queso Fresco, not an option either. This was a lovely soup with amazing flavor. Truckin' Man was not able to enjoy this one with me, a little to much heat for him. So, I took some into work to share, and my love of spice and flavor was appreciated! These meatballs may make another appearance in other dishes, they were just so packed with flavor, and perfect texture. In medium bowl combine turkey, scallions, cumin, chili powder, tortilla chips, and a pinch of salt and pepper. Mix until combined, but do not over work the mixture. Roll mixture into balls, about 1 inch diameter (I made 2 dozen). Heat large skillet over medium-high heat. Add meatballs to skillet and brown all over. Set aside. In blender, combine the salsa and the chipotle peppers. Pulse until liquified. Heat large pot over medium heat. Add the tomato paste, and stir for one minute. Add salsa and chicken stock to pot. Bring to a boil, add the meatballs, lower heat and simmer for about 15 minutes. This looks so good! I love the toppings you put on it! I lived in the Southwest for a long time and love Queso Fresco! Yum! It is supposed to snowy here, so this would be a perfect dinner! Thanks for sharing. I would love it if you would link this recipe and a few others to the In and Out of the Kitchen party! Yummy, yummy in my tummy,Kris! The only thing I would have to leave out is cilantro cause I just dislike it so much. WOW - this looks amazing. I love mexican and soup so this would be a great combo for my house...plus, adding tortillas would make it more delicious! Thanks for sharing! This sounds good. I love spicy! I do love a good Mexican meal. Pinned. I am in love with spicy foods! Thank you for sharing your recipe on Foodie Friends Friday! This recipe looks very tasty...can't wait to give it a try! Also made sure to follow on GFC & FB from my personal page while I was here today :) Would love if you followed me back too!! !